Calgary, like the rest of Alberta, is going through a difficult economic period. At the time of the injunction, Uber was connecting 1,800 Calgarians with flexible earning opportunities. If the city were to support progressive regulations that ensure safety, it could immediately facilitate thousands of income opportunities at a time when many Calgarians are most in need. Uber supports progressive regulations that address safety and consumer protection, while recognizing that ridesharing’s innovative technology makes it possible to focus on safety for riders and drivers before, during, and after every trip in ways that others can’t. In January, Edmonton joined 70 other jurisdictions around the world in adopting regulations that embrace ridesharing, which will create more income opportunities and transportation options for Edmontonians. 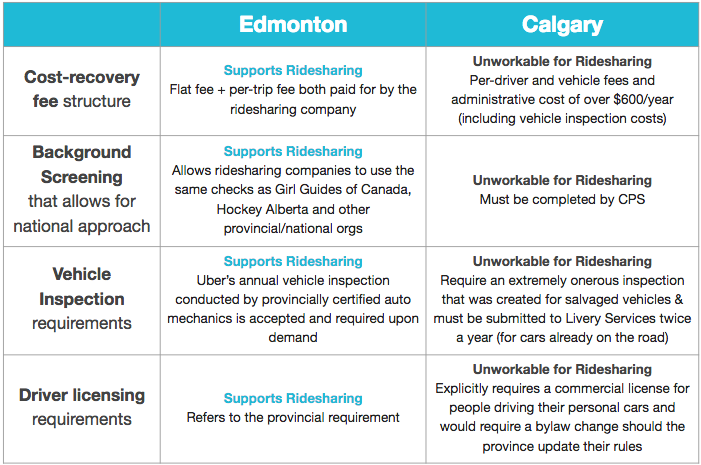 There have been suggestions that Calgary’s proposed bylaw is virtually identical to Edmonton’s and that Uber’s concerns are insincere – This is not the case. As you can see, the Edmonton bylaw contains stringent safety requirements, including mandatory background screenings of all ridesharing driver-partners and vehicle inspections. The City of Calgary is proposing requirements intended to achieve the same objective, but in a manner that is much more onerous, expensive and does not reflect the benefits and inherent safety features of ridesharing. The City’s proposal for ridesharing is unworkable because, unlike traditional taxi and limousines, ridesharing is dependent on the model where the vast majority of driver-partners provide ridesharing services on an occasional basis. That is why we are asking that city council to not approve the draft regulations, and instead direct city staff to work with us to develop progressive rules for ridesharing.